After 13 years of fighting an application for the creation of a quarry in Caledon (near Mississauga) the OMB has turned down the application. 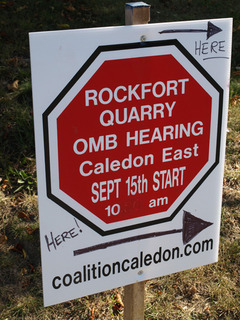 The OMB ruled that the proposed Rockfort Quarry could possibly have a “catastrophic impact” on the surrounding environment if measures to guard against potential problems did not work. The Coalition of Concerned Citizens of Caledon had been fighting the application for 13 years and have spent an estimated $2 million in the process. Too much of what is essential to the character of this Province would be lost if aggregate extraction were to be permitted on lands like the subject property. Lands situated in a significant cultural landscape, surrounded by significant natural heritage features and functions, are not lands on which extraction should be permitted in the absence of demonstration of no negative impacts. Local Woolwich residents have been fighting their own battle against quarry applications. Does this decision give them reason to hope the OMB will reject local applications? Yes I think it offers some hope. The decision does not focus only on economic or environmental considerations. It also makes clear reference to “softer” considerations such as cultural landscape and natural heritage. These factors are an important part of the local (Woolwich) opposition to gravel pit proposals. This decision also shows the importance of having strong support from local governments in a fight against the OMB. The Town of Caledon and the Region of Peel were vigorously opposed to the Caledon application for a variety of reasons, and they used their considerable resources in that fight. In the Woolwich situation, in spite of vocal and organized opposition, local council support for rejecting additional gravel pits has been lukewarm at best. This resulted in a complete overhaul of council representation in much of the Township, including a drubbing of the incumbent Mayor. This questionable support in the past suggests that local politicians do not really buy the argument that “quality of life” in the affected areas will be seriously harmed. We’ll see if anything changes in the future.